Last year I did a little Musical Education course of my own on the music of the 1960’s. And with the Motown Sound, the Wall of Sound, the Girl Groups and the Garage Bands and everything else I have to say (as I’ve said before) the 60’s is my favourite decade of popular music. And the true stars of the 60’s were two Brit Bands that have both made an everlasting impression on music and culture. And now, an everlasting impression on me. Both of these groups will probably place higher next year because I like both more and more as the months go by and I discover more of their music. I’m talking of course about The Beatles and The Rolling Stones. They both started out being heavily influenced by the Rock & Roll/Blues sound of the US as their groups formed. Both crossed the pond around the same time in the early 60’s, and both had their US breakthrough singles around the same time as well. Both groups have dynamic personalities and are focused on the music above all else. Let’s first speak on the group that is still active, and has basically become the Greatest Rock & Roll Group of all time, based on their over 50 year recording history. The Stones have contributed a slew of some of the Greatest songs ever made. The genius songwriting of “Sympathy for the Devil”, the socially conscious and stirring “Gimme Shelter”, their fun rock anthems “Jumpin Jack Flash” and “Satisfaction”. And that’s just to name a few. The reason I’m such a big fan is because they cover all these musical genres, and a lot of lyrical and conceptual diversity within their music, but they do it all in good fun. The one complaint is that throughout their career they haven’t stayed the most consistent. A lot of their late 60’s albums were hit or miss, though they did have a popular string of albums from 1969 up until 1971. Than from what my research shows, they got a little played out and started using publicity ploys to increase excitement for much of the rest of the 70’s. However throughout the next 3 decades they’ve always managed to have at least a handful of great singles and a few great albums. What I love about The Beatles, is that althought they didn’t have as long a stretch, they managed to be consistent and constantly grow with their albums. Like The Stones, they were always witty with their lyrics though The Beatles had a more polished production and vocal style. 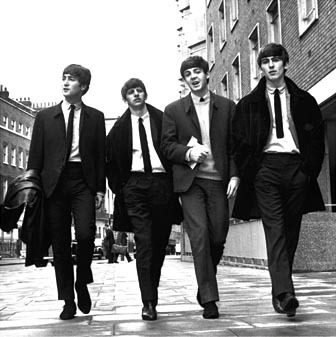 The catchiness of their early singles like “I Want To Hold Your Hand” “Ticket To Ride” “Hard Day’s Night” are what make them classic. Their simplicity really paved the way for Pop music of today. Later in their career they started to expirement with their sound to great results. Incorporating sounds and instruments from different genres and cultures, and their ability to still remain relateable and accessible to the masses while doing so is nothing short of amazing. With only 13 albums before they dismantled, The Beatles had probably one of the best recording careers of all. They were able to constantly grow, while still being top sellers, and not having to compromise their style or image to remain relevant.